Sales reporting has always been a challenge for companies, a critical sales rep responsibility disparaged by most sales reps and made more difficult and challenging in today’s sophisticated CRM world. At Front Row our goal was to change that situation. We have built a sales reporting system and APP around the needs and attributes of the sales rep. 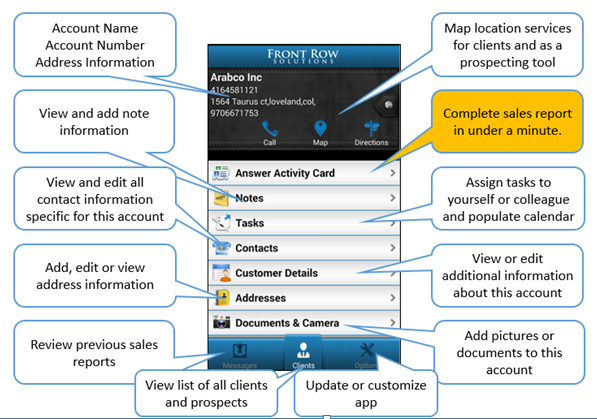 The Front Row APP is fast and easy to learn and use and gives the sales rep the ability to complete and submit their sales report immediately after a sales call in less than 60 seconds. In addition we have added a number of features to the app that helps the sales rep be more effective and productive and thereby driving adoption. Front Row is currently running at a sales rep adoption rate of over 90% and we know we can achieve that same adoption rate for you and your company. Information from the field is critical to a company’s success, it impacts decision making, client understanding, development needs, strengths and weaknesses and so much more. Join us in the Front row and let us help you achieve the success you are aiming for. The picture below is a screen shot of the Front Row app as it appears on an Android phone. The balloons describe the features that sales reps use to improve their productivity and that have helped us achieve that 90 Plus adoption rate. The highlighted balloon is the most important component and is the unique Front Row reporting system that allows a sales rep to submit their sales report in less than 60 seconds. To take a closer look at the Front Row app or to try the unique Activity Card based reporting system please click here.